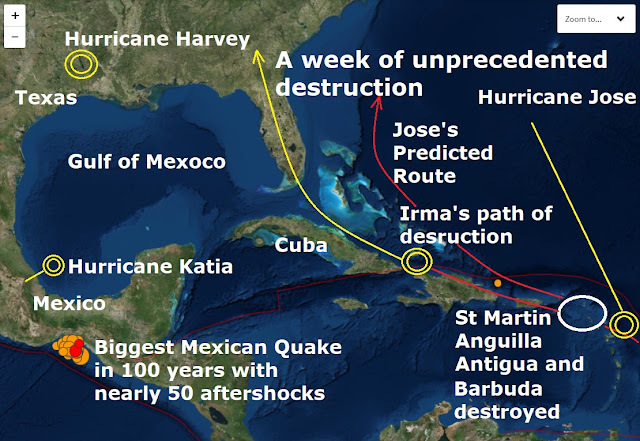 It has been an unprecedented week of destruction for a tiny part of our planet, Mexico, The Gulf Of Mexico and the Carribean. Records have tumbled along with total destruction for some islands in an area known as paradise. And it's not finished by a long way, Hurricane Irma will be 'devastating' to the US - A Fema head has declared today. Brock Long said parts of Florida would be without power for days. Half a million people in the state have been ordered to leave their homes. At least 20 people are known to have died so far. 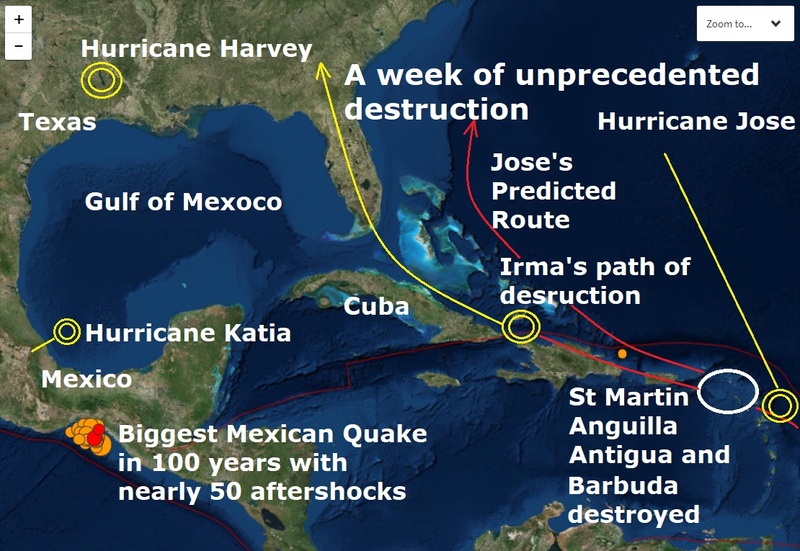 The storm, which most recently lashed the Turks and Caicos islands and brought torrential rain to the Dominican Republic and Haiti, was headed towards Cuba and the Bahamas. Just last week Hurricane Harvey was the first major hurricane to make landfall in the United States since Wilma in 2005, ending a record 12-year drought in which no hurricanes of Category 3 intensity or higher made landfall in the country. Add to that a mag 8.2 the biggest quake in Mexico's last 100 years and if confirmed the biggest quake ever in history. And whatever happens, the next 48 hours will be critical for Cuba, Miami and the rest of Florida as Irma, followed by Jose shall hit very very hard!